Team 2539 had a very long and busy day on November 3rd, 2018! 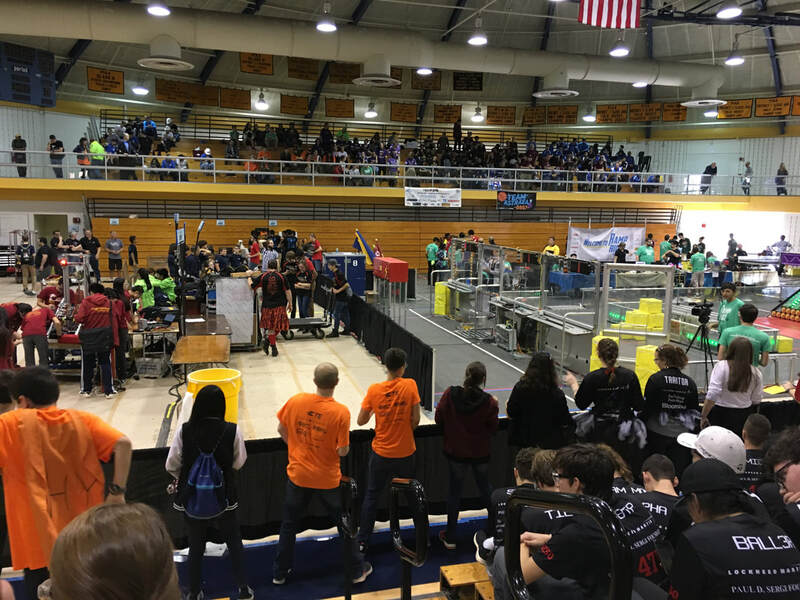 The Krypton Cougars drove out to Ambler, PA on November 3rd to compete in the 2018 Ramp Riot robotics competition! The team ranked 9th and ended the day with a win loss ratio of 4 to 3! This was the Krypton Cougar's final offseason event of 2018, meaning it was also the last time they would be using their Powerup robot in competition. Ramp Riot placed a successful end on the 2018 season for the Krypton Cougars. Team 2539 went into the qualification matches with great confidence. The team's first qualification match was the 6th, losing 359 to 337. The Krypton Cougars competed extraordinarily well, but still lost to Team 2590's (Nemesis) outstanding alliance. The 11th qualification match was the next upcoming match for the Krypton Cougars. The Krypton Cougars won the match 391 to 305, starting a phenomenal winning streak. Six matches later, Team 2539 competed in their next qualification match. This match was an exceptional one compared to the rest of the qualification matches. The Krypton Cougars teamed up with Team 365 (MOE), and won 433 to 163! The next match was a difficult match, yet the Krypton Cougars fought hard and showed the other teams what they were made of. Team 2539, Team 224 (The Tribe), and Team 2559 (Firebirds) won the match 317 to 283! Team 2539 then returned to the field for the 28th match for just one more qualification match of the 2018 season. The Krypton Cougars won this match 311 to 293, sealing a 4-1 win-loss ratio for their qualification matches at Ramp Riot 2018.
pThe Krypton Cougars move into Alliance selections as the ninth ranking team. They were then picked by Vulcan, who was in the position of the third alliance captain. The second pick of the third alliance was Team 6897 (Astraea Robotics), followed by Team 1676 ( Pascack PI-oneers). Sadly, the Krypton Cougars and the other alliance members left the playoffs quickly due to a number of reasons. The alliance lost both of their quarterfinals to Dawgma's sixth alliance, who would later win Ramp Riot 2018. Ramp Riot 2018 proved to be a great competition, and closure to the 2018 season for the Krypton Cougars. 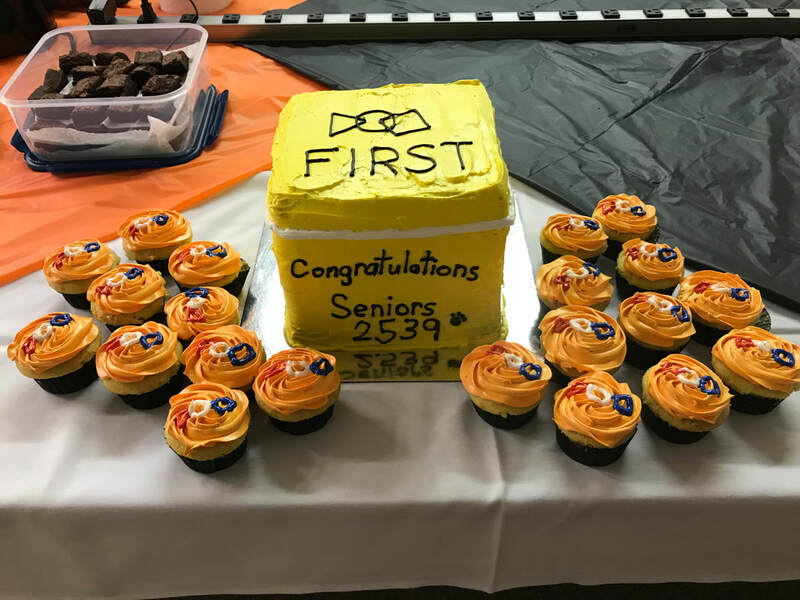 The Going Away 2018 party cake for the seniors.